The oldest major religion, Hinduism dates back to 1500 BC near the Indus river in modern-day Pakistan. While mostly practiced in India and South Asia, Hindu philosophies have spread around the world. Hindus believe in reincarnation, karma and a supreme being that represents itself in many deities. The Hindu term karma means "action" in Sanskrit. It refers to the idea that every action has an equal reaction. Thus, good works breed good outcomes while bad actions bring bad results. Even if a person's deeds are not punished or rewarded in this life, the Hindus believe that he may see the consequences in the next life. This belief in reincarnation is called samsara and directly relates to the notion of karma. If a person acts poorly in this life, he may be punished in his next reincarnation. Unlike other major religions, Hinduism has no distinct founder and varies based on many folk and communal practices in different areas. 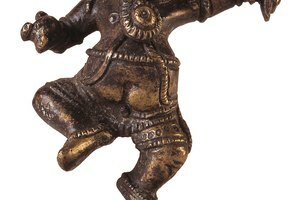 Some elements of the Hindu religion date back to ancient Indus cultures, but it developed into a more modern form around 1500 BC during the time of invasion of Northern India by central Asians. Called Aryans, these nomadic, lighter-skinned people invaded the Northern part of India. Over the centuries, varying folk practices adapted to and added onto the practice of Hinduism, blending various deities and spirits into representations of the same supreme being. Early on, Hindu beliefs reinforced the caste system in India, which divides society into four classes - Priest and Holy People, Warriors, Merchants, and Peasants. These castes ordain peoples' places in the world and what they can achieve. Hinduism has many major holy texts from different eras. The major texts, dating back to Hinduism's formation, are the Vedas. 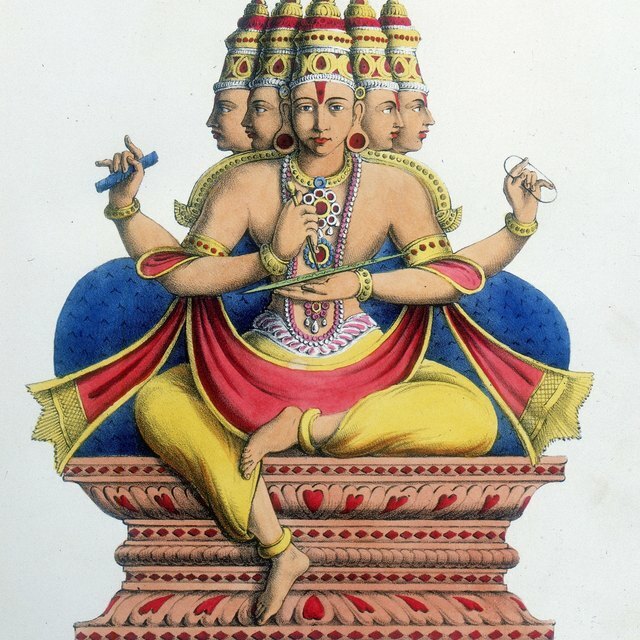 The four Vedas are: Rig, Yajur, Sama, and Atharva. The Vedas contain holy hymns, guidelines for priests, chants, prayers and sacrificial information. In addition to the Vedas are other books, with none having central importance like the Bible in Christianity. The Upanishads is another major text in Hinduism, containing interpretations of the Vedas and teachings for Hindu practice. These texts were orally passed on, originally composed around 800BCE; however, more was added to them as late as the fifteenth century. The Mahabharata is an epic poem in the Hindu tradition, written sometime between 500BCE and 100CE. The poem describes the doings of Prince Arjuna and his relationship with Krishna, a major deity. A specific section of the poem, called the Bhagavad Gita, is one of the most popular Hindu texts, as it contains guidance from Krishna on practicing Hinduism in an entertaining story. While Hindus believe in a supreme being, or god, he represents himself in hundreds of forms or avatars, which reflect parts of his essence. 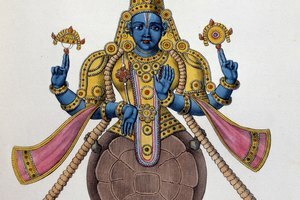 The major deities or avatars are Brahma the creator, Vishnu the preserver and Shiva the destroyer. Different sects may worship individual avatars or representations of the supreme being. A core belief of Hinduism is that the soul, or atman, is eternal. A person's actions can lead to rebirth as punishment or reward according to karma or the law of action. There are four major goals in Hinduism: Dharma or virture, Artha or success, Kama or pleasure and Moksha or release. The methods for achieving these are called yoga. Through proper action, sacrifice and rituals, a person can achieve eternal release through the cycle of life, death and rebirth. Hindus do not consume meat of any kind and respect the lives of animals as they may be reincarnated humans. 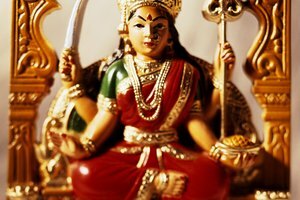 Hinduism is mostly practiced at home, although there are many temples and shrines devoted to specific deities or holy people. Hindu homes feature small shrines to an avatar of the supreme being as well as ancestors. Worship takes place in the form of leaving sacrifices or offerings and burning candles. Prayer or ritual worship may take place as recitation of mantras, singing of hymns or speaking prayers from the Vedas. 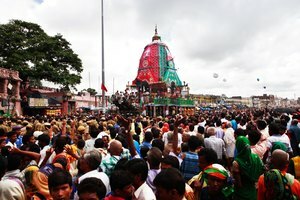 Hindus may take part in pilgrimages to holy sites or temples in major cities. 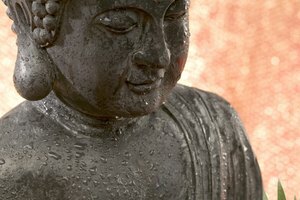 What Beliefs Do Hindus & Buddhists Have in Common? Andromeda, Ricky. "The Hindu Belief System." Synonym, https://classroom.synonym.com/the-hindu-belief-system-12085617.html. 29 September 2017.